I Am Batman boat. Photo by Jim Connolly. At the Door County Maritime Museum’s 28th Annual Door County Classic and Wooden Boat Festival on Aug. 11 and 12, Mark Lockman of Green Bay received the People’s Choice Boat of the Year Award for his 2018 21-foot Mark Lockman Sailing Dory. John and Sandy Seaman of Sheboygan Falls received the Skippers’ Choice Best of Show Award for their 1895 16-foot Warren Cole Adirondack Guide Boat. Other Skippers’ Choice 2018 Awards were given to: Mike Dovichi of Algoma for his Boomer 1947 17’ Chris Craft Runabout (Classic Inboard Award), Bob and Lois Snyder of Green Bay for their 1956 13’ Thompson Sea Skiff (Classic Outboard Award), Kurt and Gloria Breuer for their Splash 1935 24’ Burger Crocker Stonehorse (Sailboat Award), Bill and Nancy Anderson of Hudson, Ill., for their Boat 1958 14’ Lone Star Meteor (Classic Fiberglass Award), John and Sandi Seaman of Sheboygan Falls for their 1895 16’ Warren Cole Adirondack Guide Boat (Non-powered Award), and James Harmon Sr. of Mahtomedi, Minn., for his Swan 1920 18’ US Lighthouse Establishment Launch (Unique Craft Award). Many people visited the festival for the SikaFlex Challenge boat building competition and in-water time trials. The team of Patrick Smola and Carley Carniglia with their vessel, Door County Fish Boil, completed the fastest build at one hour and 30 minutes. Completing their vessel next were the Zachariasen brothers, George and Neil, with the SOS. 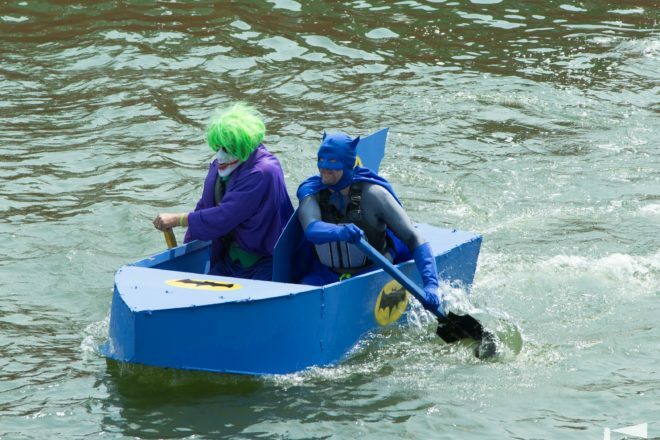 Todd Rexine and Jeremy Gauger won People’s Choice Award for their I Am Batman boat as favorite theme. They finished the course in one minute and 31 seconds. Bruce Loberg and Doug McGee finished second in one minute and 55 seconds, paddling in unison in their KISS craft. The Zachariasen brothers came in third by just a hair. The overall winners were Todd Rexine and Jeremy Gauger with 47 points; second place went to the Zachariasen brothers with 45 points, and third place to Bruce Loberg and Doug McGee with 43 points. For more information visit dcmm.org.